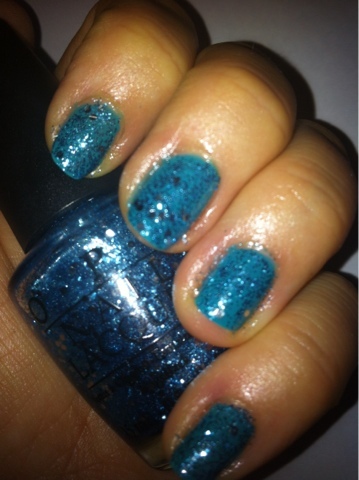 NOTD: OPI Fly &amp; OPI Gone Gonzo! These 2 colours are from recent collections. Fly is from the Nicki Minaj collection and Gone Gonzo! from The Muppet collection. Fly is a cream polish that achieved full coverage in 2 coats. I used 2 coats of Gone Gonzo! 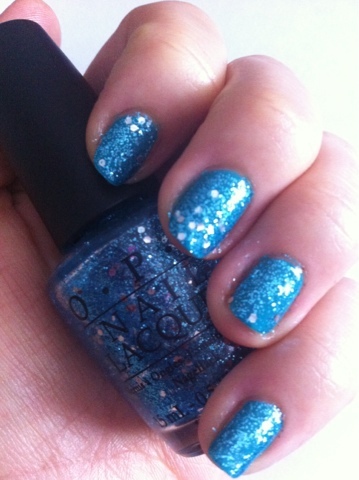 as I wanted a lot of sparkle and you definitely get that with this polish as it's packed full of small blue glitter and large hexagonal silver glitter. I recommend layering the glitters over a solid polish otherwise you risk having to chisel the polish off as it can take 4 coats to achieve full coverage.